Today would be the opening games of the 62nd Trofeo Ramon De Carraza and the NPFL All Star side would start against Malaga. We all hoped they would beat Malaga and then play Athletico Madrid in the final. Yes we believed Athletico Madrid would beat Cadiz in the other game. Yes we were optimistic like that. Breakfast in the morning of Friday was fun. Fun because people like Chris Green and Ahmed Kawu as well as Alhaji Fresh were there to crack us up. I swear Chris Green should have been acting in Nollywood. He would have made more fame and fortune. He can still do it if he wants. He came with a story about how he and Baita, the Kano Pillars General Manager got lost after shopping at the mall the previous night. The laughter was not in the story he told but how animated he was while telling it. We all laughed so hard and much our sides hurt. In fact someone actually choked on his food while laughing. Chris Green na comedian. After breakfast, the Enyimba players had to leave and Theophilus Afelokhai had mixed feelings. He told me he was supposed to be in goal for the NPFL All Star team against Malaga but he would be going to Egypt to deliver a victory for his club. I was speaking with a club official at the hotel bar later in the day as he sipped his beer. Very funny guy, this club official. So I asked why he was converting it to naira rather than enjoy his beer and he said in the part of Nigeria where he comes from, one thousand naira would buy him seven bottles of beer and he is here in another man’s country buying only one glass which was three quarters full anyway. Very funny chap, this club official. 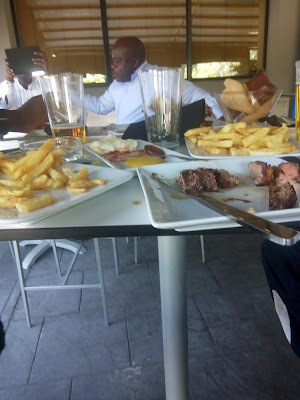 He went on to say in Nigeria he can drink beer at anytime, but in Cadiz he went to the hotel bar, gave them all the euros he had in his possession and told them to keep bringing beer for him until he exhausts what he has given them but they told him they do not start drinking beer until noon. According to him it was 11:30 am at the time. We all laughed because we know this chap, very funny club official. I got a new girlfriend today and I enjoyed her so much. Yes it is not easy feasting on the same thing for four days so when this new chic came along, I fell in love with her immediately. Now your minds are messing you up. What is this chap talking about? Why is he exposing his atrocities in Cadiz like this on social media? But you’ll do the same thing if you found this same girl I’m talking about. Okay lemme cut the chase and explain this new love. 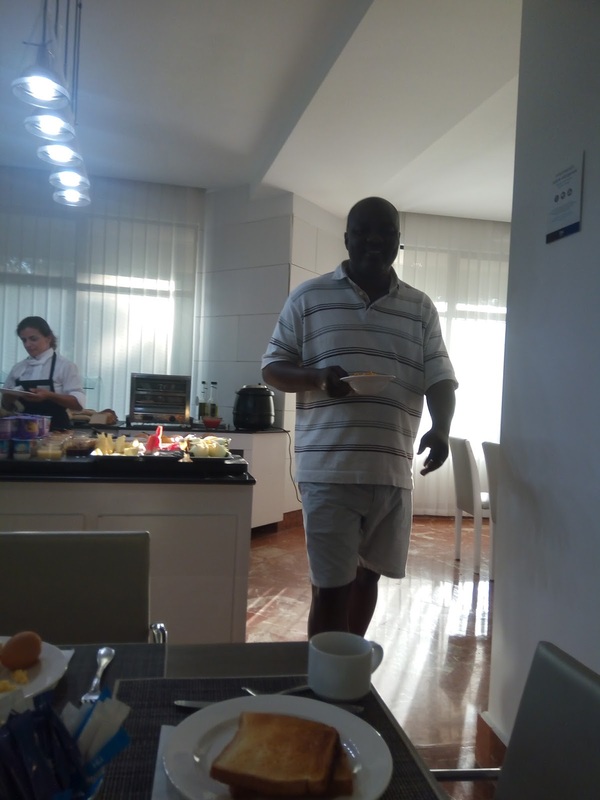 For four days we have been doing the buffet at the hotel and I must say, breakfast has been my best meal but aside that, it had been a struggle to cope with the tasteless food. As I explained to someone, the food no dey get salt or pepper. Ayo Ibidapo (the scum) came all the way from Nigeria with red pepper but as soon as the group knew he had it, we hounded him and by the second meal on Tuesday it was finished and we were back to square one. I had made up my mind that I would go look for MacDonald’s ,Burger King or KFC to get a burger or something that tastes like real food until I encountered Chief Nduka Irabor once again at the hotel bar. Nduka Irabor is a great man. He was seated there with Harry Iwuala, Fred Edoreh, Alloy Chukwuemeka and Niyi Oyeleke when I joined up. They went on to say they had been doing it, even rice and other such stuff. Wow! I joined them in the meal of chips, roast beef and a glass of wine and I knew I wasn’t going back to the hotel buffet any more. My new girlfriend? That was she. So we got to the stadium for the Trofeo Ramon De Carrazo and it was fanfare all about the place. 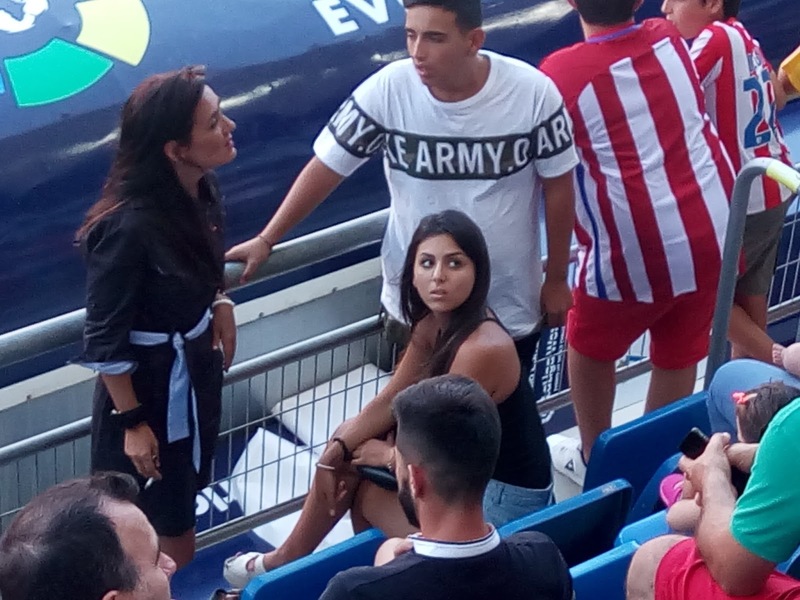 The first game between home side, Cadiz and Athletico Madrid was on and as usual Fernando Torres was running around the pitch as if he didn’t want to be there. Yes Athletico led 1-0 at half time and seemed to be winning the game when they conceded a penalty very late in the game, drew and then lost the resulting penalty shootouts with Torres fluffing the first kick. I said, why not? Where we wan see am? So he suggested we go and wait for him and the dressing room exit. Niyi said it had to be Fernando Torres and Diego Simeone or nothing. Harry Iwuala later joined up with us to wait but there was really no passion for Iwuala so he left to focus on Nigeria’s game against Malaga while Oyeleke and I waited for the Ahtletico team to come out. While waiting, I met Saul Niguez, the home grown Athletico midfielder and he obliged me a selfie but Torres and Simeone “refused” to come out. Now for those who do not know, Fernando Torres is the best striker to dorn the Liverpool jersey in the last decade; no one comes close, and we still waited, so if we had our chance to interact with him, we would. We had even spoken to the security man that he should let us take a selfie with Torres and he said he would help. And as the Athletico players came out one after the other he told us their names and asked if we were interested but Niyi and I collectively said, NO, it had to be Torres or no one. Then the crowd of home people started to gather. Lots of other people wanted what we wanted. Suddenly, Torres popped out and Niyi… chai! The way the guy snubbed us sef. Was it the anger that his team lost and he missed a penalty, or what was it sef. I no fit talk. He just walked passed us like we did not exist, then stopped in front to sign autographs and take pictures with some Spanish kids. 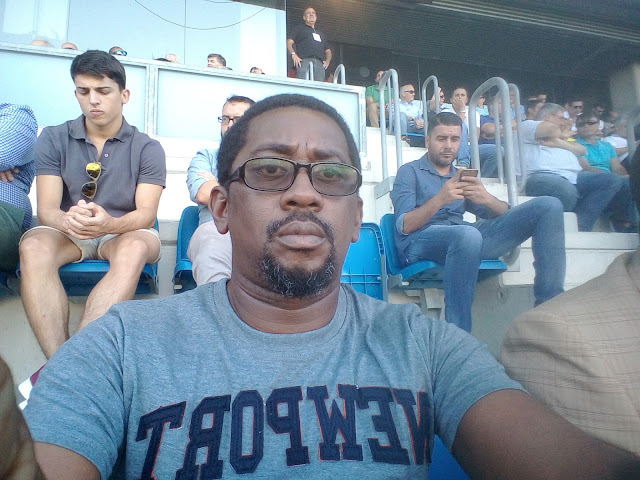 We just went back to the stadium to watch the NPFL All Star side lose 4-1 to Malaga with goalkeeper Ikechukwu Ezenwa as the man of the match obviously from the Nigerian side. He was so good that the fans behind the post sang a song in his name as he was being taken off in the second half. The city of Cadiz is surrounded by the Mediterranean sea and it can be windy and cold at times. In fact it was windy and cold the day we played against Malaga and I wore just a t-shirt. Well, lemme just say na small thing remain I no die there with cold. I tweeted something during the game, Iyi Tugbulem meh nu eli cadiz weh. That was how I felt o. but I survived it anyway. We lost 4-1 but we picked up a lot of positives from the experience and we can only get better. The Nigerian league is not the best in Africa even though we plan to be there as soon as possible, but here we were playing against clubs from about the best league in the world. The score line did not matter, did it? We returned to the hotel to face the old girlfriend again but since I had found a new one I just had bread, butter and water then went to sleep. I no dey for that one again.